There’s sewing – and then there’s sewing with leather. The latter requires a more heavy duty machine that can take thick layers of material without jamming or missing a stitch. We’ve found that when most people are searching for the best sewing machines for leather, they’re actually looking for a machine that isn’t quite as strong and powerful as an actual industrial machine, which is often used by professionals dealing with leathercraft. Instead, they’re usually looking for a consumer machine that offers more durability and power than a standard entry-level sewing machine. Basic machines may handle thin fabrics and materials just fine, but they’ll often jam or stick when it comes to dealing with thicker fabrics, layers or going over seams and binding. With a “heavy duty” sewing machine, however, you’ll get more performance and power than a typical consumer machine, without the sometimes too-much power and speed of an industrial machine, which is its own beast altogether. 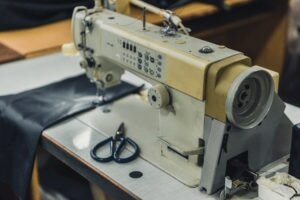 For those reasons, we’ve rounded up some of the top consumer leather sewing machines on the market, and we’ve organized them according to your budget. Fortunately, you can get a decent leather sewing machine for as little as a few hundred dollars, and you can spend far more than that if you’re looking for a top-of-the-line product. When it comes to pricing, you’ll find that many of the more expensive machines have electronics, features and conveniences that others lack, so it’s a personal decision to determine what you need to have in order to be happy with your machine. We’ve found that for all the technology and features out there, some of the best performing machines are also the most simple – and that’s one reason we chose the Janome HD3000 as our top consumer leather sewing machine.